2012 Pair of Kings Atog the Giant Disney Channel Episode:"Fight School"
↑ 1.0 1.1 1.2 1.3 1.4 1.5 1.6 "The Great Khali". CANOE. สืบค้นเมื่อ 2 April 2008. ↑ "The Great Khali Speaks On WWE Career, His Diet, Religion, More". Rajah. 27 March 2008. สืบค้นเมื่อ 28 March 2008. ↑ "The Great Khali is head over heels in love with his wife, Harminder Kaur, who he has been married to since 2002". 8 March 2016. สืบค้นเมื่อ 9 August 2017. ↑ "Khali's wife gives birth to daughter in US". 26 February 2014. ↑ "Khali at OWOW". Online World of Wrestling.com. สืบค้นเมื่อ 23 September 2007. 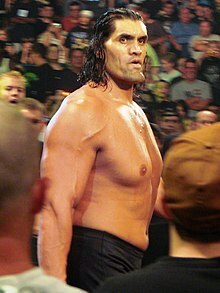 ↑ 6.0 6.1 6.2 6.3 6.4 "The Great Khali". WWE. สืบค้นเมื่อ 9 August 2017. ↑ "Breaking New Ground". WWE. ↑ "Khali still employed with Punjab police". indianexpress.com. สืบค้นเมื่อ 13 September 2014. ↑ Mullick, Rohit (30 March 2008). "Khali still on Punjab police pay rolls". The Times of India. สืบค้นเมื่อ 15 June 2008. ↑ Binks, Elliot (May 2, 2014). "WWE: 10 Tallest Wrestlers Ever (And How Giant They Actually Were)". WhatCulture.com. สืบค้นเมื่อ April 29, 2016. ↑ "SmackDown results – 7 April 2006". Online World of Wrestling.com. สืบค้นเมื่อ 23 September 2007. ↑ "SmackDown results – 20 July 2007 results". Online World of Wrestling.com. สืบค้นเมื่อ 23 September 2007. ↑ "SummerSlam 2007 results". Online World of Wrestling.com. สืบค้นเมื่อ 23 September 2007. ↑ Burdick, Michael. "SmackDown results: From dreamer to something meaner". WWE. ↑ Michael Burdick (23 March 2012). "Zack def Swagger". WWE. สืบค้นเมื่อ 23 March 2012. ↑ Powell, Jason. "7/23 Powell's WWE Battleground Live Review: Jinder Mahal vs. Randy Orton in a Punjabi Prison match for the WWE Championship, AJ Styles vs. Kevin Owens for the U.S. Championship, John Cena vs. Rusev in a flag match". Pro Wrestling Dot Net. สืบค้นเมื่อ July 23, 2017. ↑ "WWE makes Rey Mysterio, Great Khali, other big names official for Greatest Royal Rumble". cagesideseats.com. สืบค้นเมื่อ 2018-05-15. ↑ "In pics: 'The Great Khali' bounces back from injury to win in Dehradun". Dehradun: Hindustan Times. 29 February 2016. ↑ "Great Khali, foreign wrestlers entertain audience in Ludhiana". Dehradun: Hindustan Times. 7 March 2016. ↑ "Pro Wrestling Illustrated (PWI) 500 for 2008". สืบค้นเมื่อ 4 February 2015. ↑ "The Great Khali's first World Heavyweight Championship reign". WWE. สืบค้นเมื่อ 4 July 2008. ↑ "Slammy Award Winners". World Wrestling Entertainment. 8 December 2008. สืบค้นเมื่อ 19 April 2009. หน้านี้แก้ไขล่าสุดเมื่อวันที่ 23 มกราคม 2562 เวลา 00:09 น.